The Sunday Star. Read the full article here. It's not only happening in China. - it's worldwide. of the lower income group. The signs are already there. Indeed, they have been there for years now. But companies here are still adopting a wait-and-see approach before venturing into the seniors market. 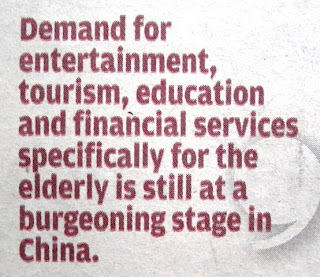 The number of senior citizens aged 60 and above in Malaysia will have reached 9% by 2020, and 15% by 2035. These figures can only go up as our society ages. A handful of local companies are already taking note of this ageing phenomenon, and have begun to invest in products and services catering to this demographic. The heathcare industry is one, and travel is another. The recent MATTA Fair had a whole section dedicated to seniors travel. Retirees make up a major portion of the market for overseas travel. They have the time and money to spend on tour packages. Pharmaceuticals, insurance, assisted living devices, homecare services, nutritional and dietary supplements, anti-ageing products, home modification businesses, lifelong learning colleges...the list is practically endless. A retirement village could look like this. Retirees in Malaysia may well see the first retirement resort in the country coming up within the next five years. Here in Malaysia and Singapore, the silver-haired market remains largely untapped. A few housing developers have carved out a niche in building retirement villages. Others have gone into providing healthcare products and services for the elderly. 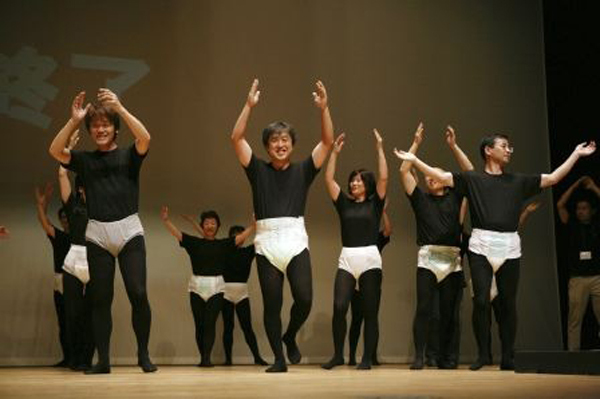 In Japan adult diapers now outsell diapers for babies - a sure sign that the population is rapidly ageing. Modelling adult diapers in Japan. The Asian baby boomers market offers companies willing to invest in it unlimited opportunities for generating revenue. But would they dare come on board?